[LOCAL: NEWS] Three APS Schools Designated for Rigorous Intervention. All three elementary schools (see table below) have received F grades for at least the past five years. I had a lot to say about this happening in the same week as APS Superintendent receiving a $250,000/year extension, so I wrote a post over at Retort. I'll also mention that at a conference for NMCCS this past weekend, Secretary-Designate Christopher Ruszkowski made an ill-informed remark about "Manifest Destiny" while also calling for more high-quality school options for all students. Yes, given our long history of oppression and colonization, it is a hurtful and misguided metaphor. Though let us not allow this misstep to detract away from his broader point about the need for us to do better by our students. I hope his comments about the need to have extended school days, honoring our best teachers (more on that below), and holding all schools accountable for teaching all students who walk through their doors are given equal consideration. [LOCAL: NEWS] New Mexico Teachers Bring Home Awards. Teachers across the state are being recognized for their tireless and impressive work. Melanie Alfaro, math department head at Deming Intermediate School, took home the prestigious Milken Educator Award for "incorporating assessments, collaborative projects, and parental involvement in her teaching strategies." Seven other teachers statewide, including four APS middle school teachers, garnered 2018 Golden Apple Awards for Excellence in Teaching as recognition of remarkable work. Teaching is a tough, often thankless job that, when done well, truly changes lives. The more we honor and reward those who've mastered their craft the better. [NATIONAL: RESEARCH] New Measure of School District Performance Yields Promising Insights. 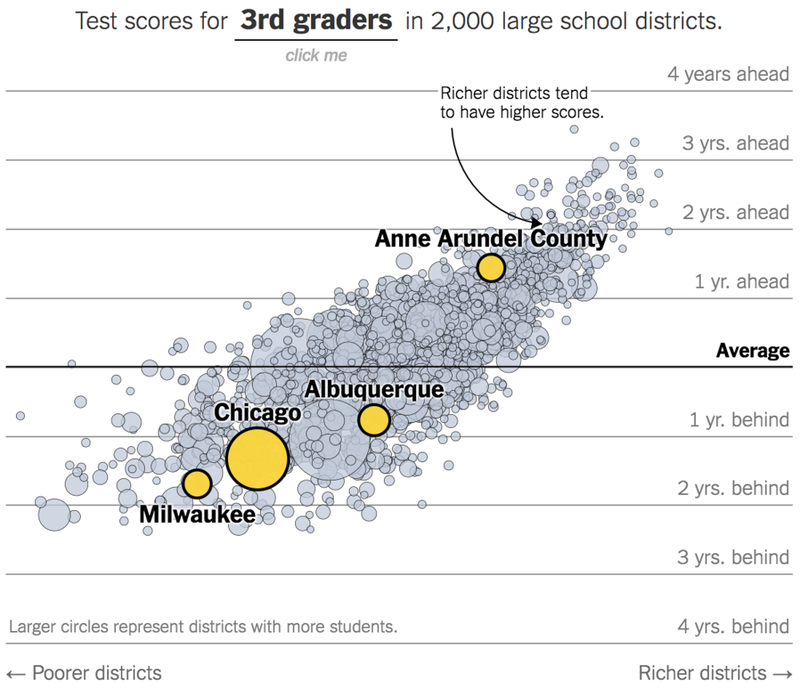 New analysis from The Upshot takes data (based on roughly 300 million elementary-school test scores across more than 11,000 school districts) from Stanford's esteemed Center for Education Policy Analysis (CEPA) for a fresh look how we think about school districts. By analyzing how scores grow or not as student cohorts move through school, Stanford researcher Sean Reardon argues that "it’s possible to separate some of the advantages of socioeconomics from what’s actually happening in schools." 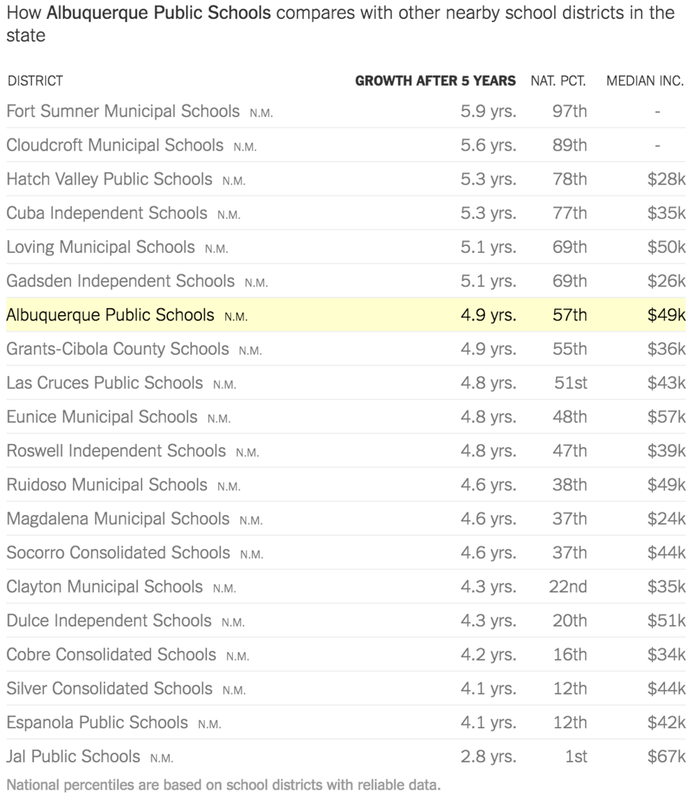 I was surprised to see that places like Hatch and Gadsden, with nearly half the median household income of Albuquerque, achieve higher learning rates than NM's largest city. I've included some graphs for APS below, but please explore for yourself.